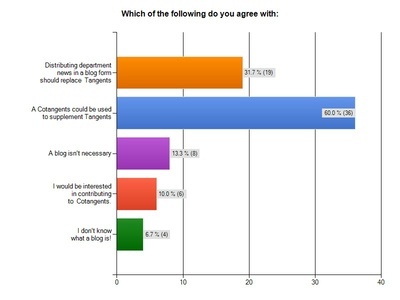 We surveyed alumni, faculty and friends a few weeks ago regarding the possibility of starting a department blog. The alumni response was generally positive. Here is the breakdown for one question, with just the alumni responses included. If you click on the image, a larger copy will pop up. Based on this response, we’ll probably give this a try but keep Tangents for the time being. It isn’t too late to add your voice to the discussion. The survey is still open at SurveyMonkey. I judged a middle school math fair a couple of weeks ago. At the fair, I found out how many Airheads, Reese’s Pieces or marshmallows it would take to tile and/or fill a typical classroom. I also learned how to decide whether to drive may family to Florida or buy airline tickets, etc. Lots of typical projects, but one was obvious, mathematical and neat, because it isn’t a textbook fact (at least as far as I know). 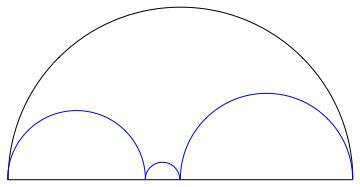 No matter what what smaller semicircles you insert, the sum of their circumferences is equal to the circumference of the larger semicircle. It’s totally obvious, but these were 6th graders and they did a nice job explaining it.